The phoenix microme|x is a high-resolution microfocus X-ray inspection system that is mainly designed for real time X-ray inspection of solder joints and electronic components. 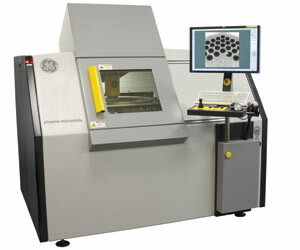 It combines high-resolution 2D X-ray technology and computed tomography in one system while offering innovative features. The versatile, easy-to-use phoenix microme|x offers outstanding image quality and can be used in failure analysis labs as well as on the production floor. It is equipped with phoenix|x-rays proprietary image processing software for the automated inspection of PCB assemblies offering higher defect coverage while improving production efficiency.